Is it just us, or do Snowtroopers have the coolest uniforms of any Imperial footsoldiers? There's something about the menacing mouthless helmets, the modular armor, and the square life-support backpacks that really works for them. Plus, they get to wear heated pants! And the color of the outfit makes perfect sense as camouflage amid the ice and snow of frozen planets or moons. We can't say the same thing about standard-issue Stormtrooper white against the dark greys and blacks that the Empire's interior decorators seem to prefer. It's kind of tough to pretend that your commander doesn't think of you as blaster bait when your shiny uniform makes you such an obvious target against the drab matte corridors of an Imperial base. Your best bet would probably be taking cover in the middle of your squad's formation. But what if you get assigned to patrol a quiet detention block or guard a captured Corellian freighter all by your lonesome? Sorry, but we don't like your odds against a couple of prowling Jedi or a Wookiee on the loose. That's why it must have been a huge relief to get called up to Blizzard Force. In fact, that crack team of cold-weather combatants were the only ones that made us think the Empire stood a chance of crushing the rebellion. 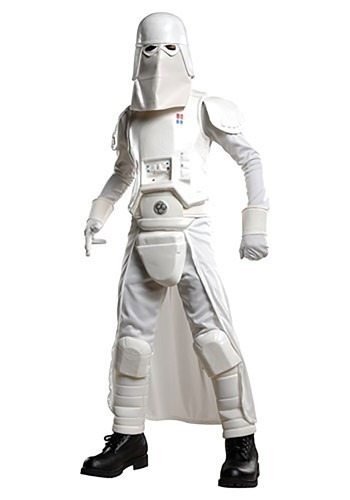 So we wholeheartedly recommend this great costume for anyone who might be a little short for a Stormtrooper, but wants to show off their love of Star Wars and its distinctive visual style nonetheless!